Nissan cut U.S. prices from $580 to $4,400 on seven models last month so car shoppers using price-search engines can find them online. DETROIT (Bloomberg) -- Nissan Motor Co.'s take-no-prisoners approach to gaining U.S. market share has the auto industry worried that a price war is brewing that will erode the profit progress made since the recession ravaged auto sales. After cutting prices on seven models and boosting incentives, Nissan's U.S. sales surged 25 percent in May, triple the industrywide gain. Sales of its Altima family sedan, which had a $580 price cut, jumped 41 percent, surpassing Ford Motor Co.'s Fusion and closing in on Honda Motor Co.'s Accord. Nissan's U.S. market share rose a full point to 7.9 percent last month, the biggest gain of any automaker. Nissan's sales boom has the industry on edge. It's the first sign of a Japanese automaker taking advantage of the weakening yen that Prime Minister Shinzo Abe has pushed down to improve Japan's economy. The currency's 15 percent swoon versus the dollar since Oct. 31 gives Japanese automakers an extra $1,500 per car they can use to cut prices or offer additional features while keeping prices even, according to Morgan Stanley. Nissan's marketing moves "strike me as a scorched earth policy of going for market share and sales volume at seemingly all costs," said Michelle Krebs, a Royal Oak, Mich.-based analyst with auto researcher Edmunds.com. That's pressuring Detroit to maintain new-found discipline on discounting. An over-reliance on rebates and price cuts helped lead to Detroit's downfall last decade. In order to survive, the predecessors of General Motors and Chrysler Group required government-funded bankruptcies in 2009 and Ford needed a self-financed reorganization. Detroit has implemented discounts on some models, such as the Chevrolet Volt plug-in hybrid, and offered promotions such as free oil changes. To resist further temptation, the U.S. automakers are armed with some of their best models in a generation, such as the Ford Fusion family car and GM's Cadillac ATS sports sedan. Stronger lineups from Detroit may be driving some of the discounting at Nissan, said Jeff Schuster, an analyst with researcher LMC Automotive in Troy, Mich.
"So far, Detroit has responded by having more competitive products that are putting some pressure on other brands that just didn't exist before," Schuster said. "Now we're seeing how the other brands are dealing with it." Detroit's delicate discipline could crumble if Nissan's price cuts are duplicated by Toyota Motor Corp., the world's best-selling automaker, said Brian Johnson, Chicago-based auto analyst for Barclays. "If Nissan keeps up this pace, then the next move on the chess board would be from Toyota," said Johnson, who recently spoke with top executives at GM and Ford about Nissan's pricing strategy. "Ford and GM view Toyota as the price-setter in the market. They're not as worried about these type of moves coming out of Nissan, which has a history of erratic incentives." 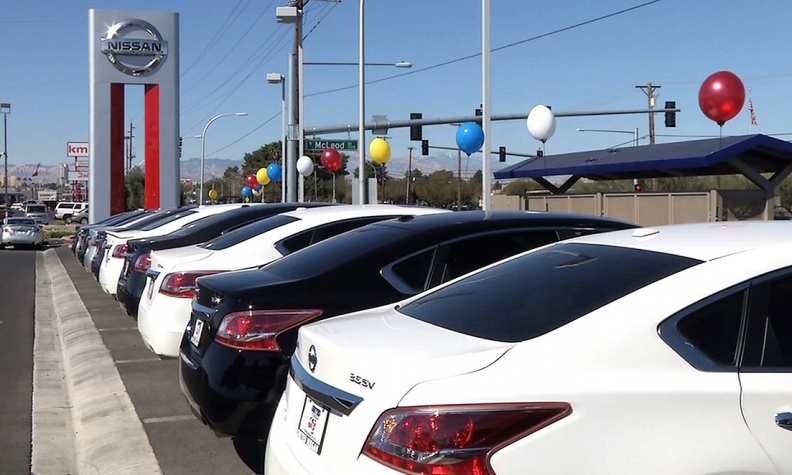 Nissan cut prices from $580 to $4,400 on seven models last month so car shoppers using price-search engines can find them online, said Jose Munoz, the automaker's senior vice president of sales and marketing. "Our strategy is not to be at a discount," Munoz said in a June 11 interview. "We want to be simply competitive so that we are included in search engines which are used by consumers." Munoz said Nissan's incentives were $600 per-vehicle below the industry average in May. However, Autodata Corp. estimated Nissan had incentives of $2,805 per vehicle last month, up 6 percent from a year earlier and $141 per model above the industry average. The market research company said the announced price cuts affected only newly produced models and those already on dealers' lots were treated as having cash incentives known as equipment allowances. Nissan will soon begin more aggressive advertising of its price cuts, Munoz said. "Consumers are going to realize that we are present in some pricing segments where before they were not seeing us," Munoz said, adding that he expects some competitors to match Nissan's price cuts "if they think they do not have the right position." Toyota sees no need to modify its incentives and pricing in response to Nissan, said Carly Schaffner, a company spokeswoman. Rather than across-the-board price cuts, the automaker has taken a more surgical strategy for offering deals. Toyota is offering discounts on models that need them, such as the Camry family car, which has posted four consecutive months of declining U.S. sales. Toyota is offering $500 cash back on the Camry in various regions of the country, including Los Angeles and central Ohio, according to the carmaker's website. "We definitely have incentives on Camry," Schaffner said of the model that has been the top-selling car in the United States for the past 11 years. "Our position on the mid-size segment is that it is absolutely competitive. There are a lot of great cars and everybody is coming out with their new vehicles." Toyota's incentives declined 5.1 percent to $1,844 per vehicle in May, according to Autodata, which is based in Woodcliff Lake, N.J.
Honda, which reduced discounts 23 percent last month to $1,811 per model, is holding the line on pricing, said John Mendel, the automaker's executive vice president for U.S. sales. Honda's models are "selling primarily on their merits despite increasing price and incentive pressure from the competition," Mendel said. "A good price can certainly bring shoppers, but in the end, a buyer is really looking for value." Japanese automakers may wage a "silent price war," in which they outfit new models with extra features while keeping sticker prices in check, Adam Jonas, an analyst with Morgan Stanley, wrote in a June 5 report. Honda's new 2014 Acura MDX has $4,000 in additional content, yet that model's price is only $1,710 higher, Jonas said. "Is that a discount? You bet it is," Jonas wrote. "We believe the Japanese will not slash prices, risking accusations of predatory behavior and spoiling Abenomics for everyone. The Detroit players won't want to cut prices, risking negative share price reactions from investors." The yen has strengthened during the past month, rising 9.6 percent since May 17 after tumbling 32 percent since September to 103.21 yen per dollar. At 94.11 at the close of last week, it remains stronger than a decade ago, when the yen averaged more than 120 yen per dollar from 2001 through 2003. It averaged almost 200 in the 1980s. GM has already responded to the stealth price cuts from its yen-aided competitors. The automaker said June 5 it's offering free maintenance, such as oil changes, for two years or 24,000 miles on 2014 Chevrolet, Buick and GMC models. Price cutting destroys profits. A $1,000 per car discount reduces revenue by about 4 percent, Barclays's Johnson said. In an industry where a 5 percent margin is considered healthy, a $1,000 price cut can turn a car from a modest money maker into a money loser, he said. "There's no doubt that some of the improved profitability in Detroit is from having better cars at better price points," Johnson said. "They've learned their lesson on discounts and they're very reluctant to go back there." Even with their newfound restraint, Detroit offers above average incentives because their big-ticket trucks often feature hefty discounts. GM's incentives rose 8.4 percent in May to $3,651, Ford's jumped 17 percent to $3,073 and Chrysler's increased 3.2 percent to $3,282, according to Autodata. GM responded last week to Nissan's 18 percent price cut on its Leaf electric car. GM cut the price of its Volt plug-in hybrid by $4,000 on the 2013 model and $5,000 on the 2012 version. GM said it was seeking to remain competitive in the electric vehicle category and looking to reduce Volt inventory, which is twice the industry standard. Nissan's price cuts lowered the average price consumers paid for its models by $500 in May, Johnson said. The biggest decline came on the Rogue small crossover, which had a 12 percent drop in average transaction price, according to an analysis by Edmunds. Sales of the Rogue, with a $2,300 price cut, soared 45 percent in May. "The discounts were pretty high for that model," said Jessica Caldwell, Edmunds chief analyst. "The Rogue had its best sales month ever. So for that car, the price cut really worked." Nissan had more room to cut prices on the Rogue because it builds that model in Japan, where the weakened yen now makes it much cheaper to manufacture. Imports make up 31 percent of Nissan's sales in the United States, more than Toyota or Honda, according to a Feb. 27 report from Deutsche Bank entitled "Re-rising Sun?" Even the models Nissan builds in the United States benefit from the weaker yen, according to Deutsche Bank. Citing data from the National Highway Transportation Safety Administration, Deutsche Bank said 15 percent to 35 percent of parts in Nissan's North American-built models come from Japan. The weaker yen will add $2.7 billion to Nissan's operating profit this year, Deutsche Bank estimated. The automaker's net income margin will grow to 5.7 percent in the 2015 fiscal year from 3.6 percent last year, Deutsche Bank forecast. Nissan's Munoz disputed that foreign-exchange rates, known as forex, have played a significant role in the automaker's pricing or profits. "In reality, the forex is not a factor for American- produced vehicles," Munoz said. "What we see is some of the key models that are coming from Japan actually are not the best- performing at the moment." Nissan will continue to be scrutinized by its competitors as they weigh whether to stay on the sidelines or engage in a price war, LMC's Schuster said. "All eyes will certainly be on June to see what kind of numbers Nissan produces," Schuster said. "If we see any kind of trend here, then we'll see other Japanese brands acting first. And then Detroit will be under the microscope."